With the great Venture Brothers battle of last year in the past, Vertigo’s Fables panel was open to all who wanted to attend. However, there was almost a hostile take down of the Mythbuster panel next door when the wall started rumbling and the floors shook. Speaking at the panel was Bill Willingham, Shelly Bond, Steve Leialoha, Todd Klein, Andrew Prepoy, Chrissie Zullo, Chris Robertson and Matt Sturges most of the creative team, minus Mark Buckingham. Buckingham was back in England working on the 100th issue. 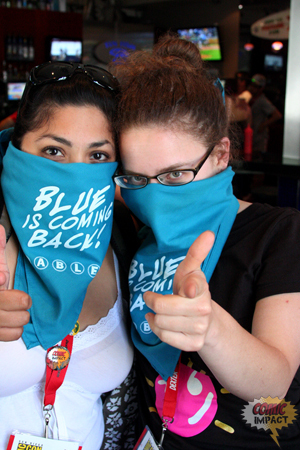 For attending you got a special gift …a blue handkerchief which read, “Blue is Coming Back.” For all you Fables fans, like me, it’s a great way to participate in the “potential” upcoming storyline. Fables 98 will be the last of the Rose Red back story arc. Making way for issue 99, this will be all about Mr. Dark, which sets up issue 100. We got to see some beautiful pages of Castle Dark by Inaki Miranda. Castle Dark is being built in the once familiar setting of “Fable Town.” Now, the big 100th issue is going to actually be 100 pages. The cover shows a woman in a long flowing red dress in a dual stance against Mr. Dark. I have to say this cover gave me sexwee when I saw it, it is absolutely beautiful. I would give Sheldon’s right arm for the original art. Some of you may be thinking we’ve seen a dual in the pages before and it wasn’t very detailed, Willingham said that we will see this entire one in the pages, not just have it talked about. There are some extras in this big issue, the Fables board game, Fables paper dolls including set pieces, a backup story with Buckingham writing the story and Willingham drawing it. I think that is a fun idea and can’t wait to read it. You will also get to see some interior art by Chrissie Zullo who is the cover artist for the Cinderella spinoff. Speaking of the Cinderella spinoff, it was announced that we will see another arc for our favorite spy called “Cinderella: Fables are Forever.” There is going to be more back story for Cindy where we meet her evil counterpart. They have a very long history and she is a super spy too. We will also see a lot of Fables from different countries in this book. So anyone who was missing some Fables from a different culture, you just might see them in the new Cinderella book. Chrissie Zullo will be back doing the covers, I really enjoyed them in the first arc and am looking forward to more from her. Jack of Fables is bringing back the Paige sisters. Robin has a baby and I think everyone can speculate who the father is. They are just in time for the landmark 50th issue. The creators have promised not to kill every character off but will show every character who has been in the book. Even the dead one, possibly as a rotting corpse but they will be there. A few extra upcoming details are…The cubs might be split up and kind of scattered in different places around the world, which will give us some more Fables from different cultures. There is no plan for a spinoff for them or any character unless Willingham feels the story is strong enough and written well enough to stand alone. I know I had heard a few rumors that there was going to be another ongoing connected to Fables and was happy to hear it will stick with what they already have, at least for the time being. We will see Feathertop again in an extra story in the 2nd Deluxe Collection of Fables, but they could not say when that will be out. They also said that a future storyline for Bo and Peter is in the works. I’m excited for that, the novel Peter and Max was just not enough for me. And on that note, Peter and Max will be coming out as a paper back in January 2011. This panel was a lot of fun and very informative to a Fables fan like myself. For those of you who don’t know, Fables was the first comic I read and really opened up the flood gates of awesome for me. I now understand how they can create story lines that are equally dark and funny. They all seemed to have so much fun talking about the characters and universe they have created. I will definitely be attending their panel again next year and will say anyone who enjoys fun will enjoy the panel, even if you aren’t reading the book. Actually if you aren’t reading the book, go out and read it! Right now, go out and get the first trade , you will love it.